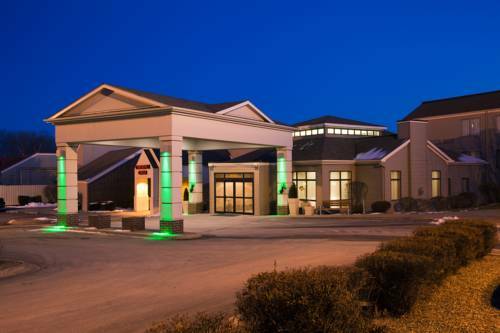 Coralville Hotel's Near Kinnick Stadium, Carver ArenaConveniently situated off I-80, the Holiday Inn Coralville hotel is where Hawkeyes come to relax and rest their heads. For those visiting the Iowa City - Coralville area, the hotel's location near the University of Iowa is ideal for both business and pleasure.From exciting museums to first-class shopping, endless attractions await you in Coralville, IA. This hotel's central location is only minutes from both Kinnick Stadium and Carver-Hawkeye Arena, making it easy to watch the Hawkeyes play. As well, the nearby Coral Ridge Mall has more to offer than shopping, such as an antique carousel, an NHL regulation-sized ice arena and the Iowa Children's Museum.Surrounded by companies like Procter & Gamble, Act and ALPLA, the hotel's location in Coralville, Iowa is the perfect choice for your next business trip. We're also not far from the VA Medical Center and Mercy Hospital. Besides free Wi-Fi access and a Business Center, the hotel features 6,500 square feet of flexible meeting space.As the hotel's guest in Coralville, Iowa, you're in for an unforgettable stay. The Twelve01 Kitchen & Tap is open daily for breakfast, dinner & room service. Take a refreshing swim in the indoor pool or relax in the whirlpool tub. Make your reservations today, and experience all the incredible amenities and services this hotel has to offer you. Children's program - Childrens Museum located at Coral Ridge Mall 2 miles away. Isaac's Hall: This room can be used in a variety of settings including classroom, theater, reception, and more for up to 75 people. Coral Ridge MallLargets mall in Eastern Iowa. Stores include: Dillards, Yonkers, Best Buy, JC Pennys, Sheels, Childrens Palace, Childrens Museum, Ice Rink, American Eagle, Eddie Bauer, Rue 21, Lane Bryant, Target, nail saloos, food court, jewelry stores and much more. Auto MuseumAuto Museum located just down the street from the hotel showing off classic cars from years past. Open Daily.